Pennsylvania’s Tioga County is home to great small towns and some of the state’s best outdoor adventures. While there are many other fantastic areas to explore in the county, most visitors head to Leonard Harrison State Park and Colton Point State Park, which sit on opposite side of Pine Creek Gorge, better known as the Pennsylvania Grand Canyon. The Pennsylvania Grand Canyon is a 47-mile gorge located in Tioga and Lycoming Counties. Reaching depths of up to 1,450 feet, the canyon is breathtakingly beautiful, even if comparisons to the real Grand Canyon are a bit farfetched. Still, there are few places in Pennsylvania more beautiful than this gorge. With most visitors to the area staying within the two state parks on the canyon’s northern end, that leaves the rest of the Pa. Grand Canyon for the adventurous. One great way to enjoy this tranquility and to uncover the canyon’s true beauty is to take a bike ride on the Pine Creek Rail Trail. 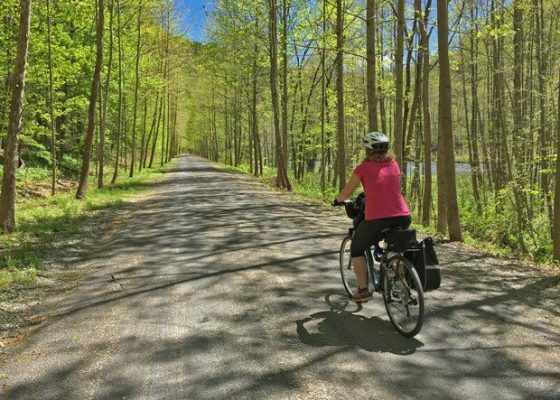 Named by USA Today as one of the best places in the world to ride a bicycle, the Pine Creek Rail Trail extends 65 miles from just north of Wellsboro to Jersey Shore, Pa., along the banks of the Susquehanna River.